Our little bunny is ready to embark on his path to becoming a super awesome ninja! His how-to book tells him he must work alone, be super sneaky, and possess all sorts of ninja traits. But is he cut out for the ninja life? Especially if it means leaving his friends behind? The story is told solely through a list of rules and some pretty adorable illustrations. 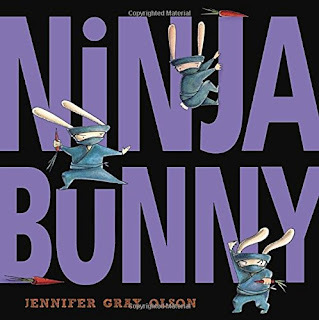 However, I was really hoping that it would be another totally awesome ninja book—one that I could add to my ninja-storytime-repertoire. I mean, it's cute, but that's about it. The whole book is about the irony between what the rules say the bunny should be doing, and what the illustrations actually depict (which is usually failure). And that's a bit hard to communicate to a group of kids in a storytime. It'd be better for one-on-one reading, but still not my favorite. Maybe you could try it out and see what you think.